Manufacturer of a wide range of products which include surge protection device - surge protector, surge filter (type 3), dc spd (type 3 ), type 2 / class ii / class c surge arrester, type 1 2 / class i ii / class b c surge arresters and spark gap lightning arrester. Surge protection device (SPD) - a device that is intended to limit transient overvoltages and divert surge currents; it contains at least one nonlinear component. One port SPD - an SPD connected in shunt with the circuit to be protected; a one-port device may have separate input and output terminals without a specific series impedance between these terminals. Two port SPD - an SPD with two sets of terminals, input and output; a specific series impedance is inserted between these terminals. Voltage switching type - an SPD that has a high impedance when no surge is present, but can have a sudden change in impedance to a low value in response to a voltage surge; common examples of components used as voltage switching devices are spark gaps, gas tubes, thyristors (silicon-controlled rectifiers) and triacs; these SPDs are sometimes called „crowbar types“. Voltage limiting type SPD - an SPD that has a high impedance when no surge is present, but will reduce it continuously with increased surge current and voltage; common examples of components used as nonlinear devices are varistors and suppressor diodes; these SPDs are sometimes called "clamping type“. Combination type SPD - an SPD that incorporates both voltage switching type components and voltage limiting type components may exhibit voltage switching, voltage limiting or both voltage switching and voltage limiting behaviour depending upon the characteristics of the applied voltage. Modes of protection - an SPDs protective component may be connected line-to-line or line-to-earth or line-to-neutral or neutral-to-earth and combination there of; these paths are referred to as modes of protection. Sparkover voltage of a voltage switching SPD - maximum voltage value before disruptive discharge between the electrodes of the gap of a SPD; it is used for classification of the SPD class I and II by testing impulse with waveshape 1.2/50μs. Owing to our rich experience and knowledge of this domain, we have been able to offer the best quality of Power Supply of Sensitive Section Units. The offered power supply of sensitive section units are known for their longer serving life and compact design. Being a quality focused organization, we assure that the optimum quality of the offered power supply of sensitive section units is never compromised at our end. P-k16-k16-k16-k16/* AC/DC is type 3 surge arresters according to EN 61643-11 and IEC 61643-1 designed for protection of electronic appliances in L.V. supply systems against impulse surge. They are constructed for mounting on DIN rail 35mm for nominal current of 16A. This complex range is produced for nominal voltage within the range of 12, 24, 48, 60 and 110V AC/DC. The right function of P-k16/ *AC/DC is indicated by green LED diode. P-k16/* AC/DC offers a low voltage protection level which make them ideal for protecting terminal equipment in industrial electronics and building management systems. The inputs and output terminals for series connection and the protective circuit designed for high line currents. PIIIM is surge arrester type 2 and class II according to EN 61643-11 and IEC 616431. Complete device consists of a base part and pluggable module. These arresters are recommended for use in the Lightning Protection Zones Concept at the boundaries of LPZ 1-2 (according to IEC 1312-1 and EN 62305) for equipotential bonding and elimination of transient over voltage that originate during atmospheric discharges or switching processes. 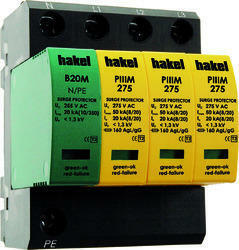 The combination of PIIIM + B20M is suitable for use in TNS and TT systems. The modular PIIIM surge arresters design set new standards in terms of safety and user friendliness. The proven protective circuit with heavy-duty zinc oxide varistors in combination with the “Thermal Disconnecting Control” monitoring device are characteristic of the PIIIM series type 2/class II arrester. 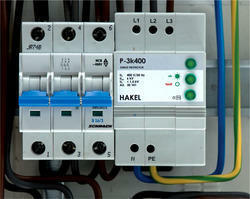 The pluggable modules ensures the proper & strong fixing to the base part. Neither vibration during transport nor the enormous electromagnetic forces of discharge can loosen the modules. For the replacement purpose, they can be easily replaced without tools by simply pulling out the protection modules. The “Thermal Disconnecting Control” monitoring device in the varistor based surge protection devices are well proven technology in terms of safety and considers practical applications where arresters might be damaged. Hakel surge arresters with “Thermal Disconnecting Control” mechanism, the intensity of the discharge current and the surface temperature of the heavy-duty varistor are evaluated. The visual indication of green and red indicator flags shows the proper functioning of every protective circuit and varistor. Apart from this standard visual indication, PIIIM... DS devices feature a three-pole remote signaling terminals (Potential Free Contact). With its floating changeover contact, the remote signal can be used as a make or break contact depending upon the circuit concept. PIVM is lightning + surge arrester type 1+2 and class I+II according to EN 61643-11 and IEC 61643-1. Complete device consists of a base part and pluggable module. These arresters are recommended for use in the Lightning Protection Zones Concept at the boundaries of LPZ 0-2 (according to IEC 1312-1 and EN 62305) for equipotential bonding and elimination of transient over voltage that originate during atmospheric discharges or switching processes. The combination of PIVM + B25M is suitable for use in TNS and TT systems. The modular PIVM surge arresters design set new standards in terms of safety and user friendliness. 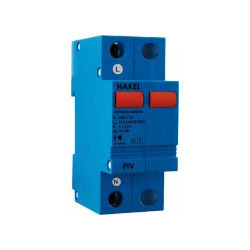 The proven protective circuit with heavy-duty zinc oxide varistors in combination with the “Thermal Disconnecting Control” monitoring device are characteristic of the PIVM series type 1+2/class I+II arrester. The pluggable modules ensures the proper & strong fixing to the base part. Neither vibration during transport nor the enormous electromagnetic forces of discharge can loosen the modules. For the replacement purpose, they can be easily replaced without tools by simply pulling out the protection modules. The visual indication of green and red indicator flags shows the proper functioning of every protective circuit and varistor. Apart from this standard visual indication, PIVM... DS devices feature a three-pole remote signaling terminals (Potential Free Contact). With its floating changeover contact, the remote signal can be used as a make or break contact depending upon the circuit concept. The lightning current arresters are constructed as an encapsulated spark gap technology for installation in main switchboards. For TNS and TT systems it is necessary to combine these arresters with lightning current arrester HS50-50i which is recommended for equipotential bonding between N and PE. The main use of HS100i is in industrial installations such as transformers, the main switchboards of large industrial buildings and places with high risk of a direct lightning strike and with an external lightning protection of the highest class I to IV. It is also suitable for applications in unmeasured parts of electrical installation. PIV is lightning arrester type 1 according to EN 61643-11 and IEC 61643-1. These arresters are recommended for use in the Lightning Protection Zones Concept at the boundaries of LPZ 0 – 1 (according to IEC 1312-1 and EN 62305) for lightning current equipotential bonding and elimination of switching surges that originate in power supply systems entering the building. The PIV is mainly intended for use in TNC systems. For TNS and TT systems it is necessary to combine these arresters with lightning arrester B25, B50 or B80 which are intended for equipotential bonding between N and PE. The main use of PIV12,5 arrester is in structures of LPL III – IV according to EN 62305, e.g. 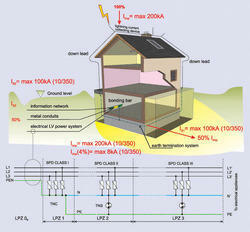 residential houses with cable supply and subdistribution boards of big industrial structures.